This page covers advantages and disadvantages of LTE CSFB. It mentions LTE CSFB advantages (Pros) and LTE CSFB disadvantages (Cons). 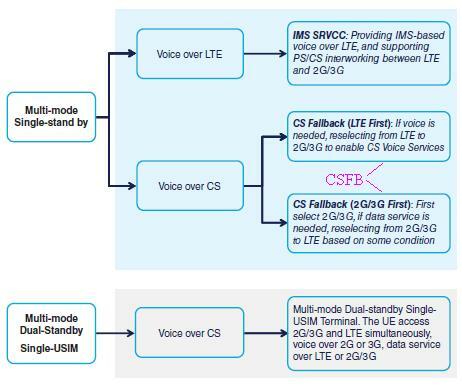 CSFB stands for Circuit Switched Fallback and LTE stands for Long Term Evolution. Introduction: As we know LTE is an all IP network and hence voice over LTE is implemented with couple of options. One option is based on IMS (IP multimedia subsystem) and the other is based on CSFB (Circuit Switched Fallback) to existing 2G/3G network. CSFB is a mechanism used to handover voice calls to existing 2G/3G network's CS domain part. This handover is used for both MOC and MTC. Here MOC stands for Mobile Originated calls and MTC stands for Mobile Terminated Calls. LTE CSFB mode is used to either place or receive voice call in LTE network with the help of existing 2G/3G circuit switched cellular networks. ➨It reuses 2G/3G CS domain and hence saves investment cost for providing voice support in LTE network. ➨End users do not find any difference in voice services as existing 2G/3G CS domain is reused. ➨Emergency calls are supported from beginning of LTE network deployment. ➨Charges remains same as levied in 2G/3G networks. ➨Legal interception is supported from beginning. ➨It affects use of existing equipments. For example, SGW should be enhanced. Here PS session (i.e. Data session) should be maintained when UE falls back to 2G/3G CS domain. Proper care need to be taken so that data sessions do not get suspended or interrupted. ➨It affects signaling flow. Additional signaling messages are generated to establish voice call to switched network (2G or 3G) from LTE. ➨Delay to setup voice call will increase in LTE compare to direct 2G/3G voice call establishment. ➨It affects the performance criteria. This is due to the success rate of MTC call due to inaccurate mapping between TAI and LAI. Proper mapping will increase the chances of success rate.